Premium Diesel Engine: A 24.5 hp (18.3 kW) optimized combustion diesel engine has large power output, yet low fuel consumption. Fluid service and inspection locations are easily accessible to the operator. Headlights: 55W lamps are the brightest in this tractor's class. Foldable ROPS: The standard fold-down roll bar allows you to move into low clearance areas quickly and easily. Control Levers: The HST with HI-LO range lever allows the tractor to overcome a wide range of load tasks. The rear PTO and mid PTO can be controlled separately or together with a simple in-line shifting lever. The height adjustment lever allows the operator to control the mid-mount mower's cutting height easily. Rear PTO and 3-Point Hitch: The rear PTO and high capacity three-point hitch can accommodate a variety of implements and attachments. The flip up PTO guard ensures easy implement attachment. The bent lower link assists with easy implement installation. Ergonomic Operator Station: The ergonomically designed workstation places operator controls within easy reach for maximum comfort. Four Wheel Drive: Single-lever engaged 4WD is standard on the CS2510 tractor. Distinctive Hood Design: The streamlined hood design improves the visibility for the operator. A vertical opening hood allows for easy access to the air filter, fluid service and inspection locations fuse box and electrical components. Twin HST Pedals: Twin HST pedals offer easy forward and reverse movement with smooth engagement, acceleration and deceleration. Pedal pressure is minimized which reduces operator fatigue during long hours of use. Mid PTO: The standard mid PTO (2,200 rpm) allows you to use implements such as a mid-mount mower. Illuminated Dashboard: The dashboard illuminates when the engine is started. The digital gauge package includes tachometer, fuel and temperature gauges along with a low fuel warning lamp. Front End Loaders : SL2410: Fits the KIOTI CS Series Sub-Compact tractors. 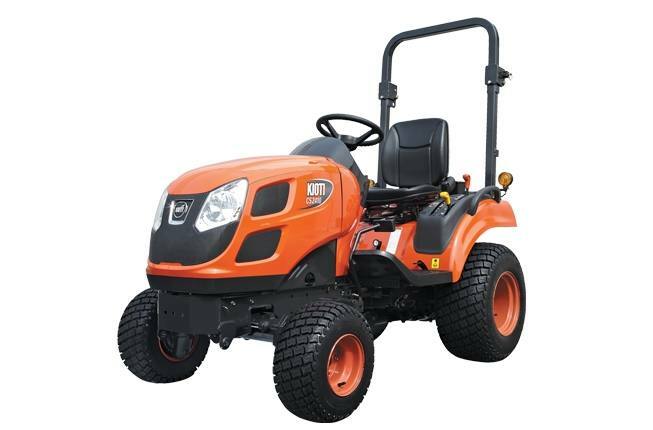 Specifications may vary with tractor model, front axle configurations, tire size option and type of attachment and are subject to change without notification. Backhoes : SB2410L: Fits the KIOTI CS Series Sub Compact Tractor.